Haddock is a white fish, similar to cod, that bakes quickly in the oven for a healthier option to fried fish fillets. Haddock and cod also go by the term scrod in some northeastern areas of the United States. 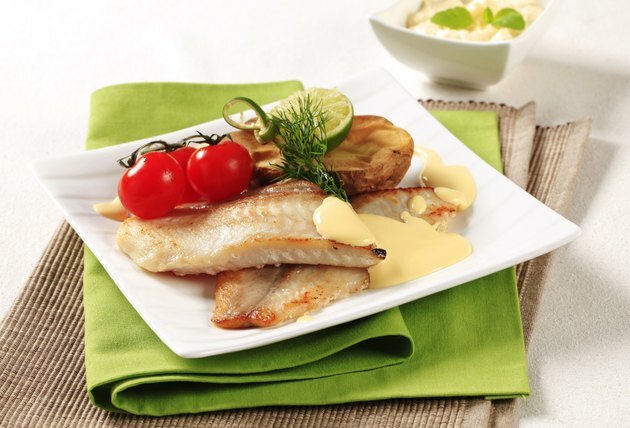 A fresh haddock fillet has a translucent color and firm texture that holds together. A chalky color is a sign the fish is not fresh. Bake haddock fillets with a little butter and seasoning, instead of a bread coating, to bring out the flavor of the fish. Place the oven rack in the middle setting, and then preheat the oven to 350 degrees F.
Apply non-stick spray oil to the inside of a glass baking dish. Place the haddock fillets in a single layer inside the dish. Cut the lemons into 1/4-inch thick slices with a sharp knife. Pour the melted butter evenly over the fillets. Sprinkle salt, pepper and seasoning of your choice over top of the fillets. Cover the top of the fillets with a single layer of sliced lemons. Place the uncovered baking dish in the middle of the oven rack. Bake the haddock fillets for about 20 minutes, or until the fillets flake with a fork. Remove the baking dish from the oven and scoop the fillets out of the dish with a slotted spatula. Serve the fillets immediately. Dill weed or lemon pepper seasonings are good options for haddock.